Today was our special day. Taiko Workshop with Moko sensei! We were so excited to play taiko from the beginning of the day. Some of our friends came to school with Hachimaki on our head. Our moms, dads and babysitters were also looking forward to this Taiko Workshop. We practiced how to play taiko in our circle time with a tin box and two wooden blocks. Each of us had a turn to create our own rhythm. It was all different speed, rhythm, volume and length. Some friends played very loud and fast, and the other friends played gentle and slow. Making music is always fun. Having the opportunity to play the real taiko is very special experience for us. We are very lucky because Moko sensei gives Ohana this special opportunity to drum. Our morning play time was shorter than usual, but we still had fun to play with a puzzle, to construct somethings with wood blocks and make shapes with our handmade playdough. Our playdough was very soft and smooth., it was nice feeling to squeeze it with our fingers. We made lots of cup cakes and they looked like real cup cakes. The puzzle table is very popular these days. Our concentration is getting better and better, and we want to try more difficult puzzles everyday. After the early snack time, we walked all the way up the hill. Some moms even came to walk with us. It was just like the hiking. We had to climb all the way up the hilly street. We used the rope to walk on the busy street. Kai needed our strong legs because he was the one pulling our rope. It was a long walk, but all of us made it easily without any accidents. Our walking ability is much better now. We are well trained by walking to the park without rope. In the hall, there were some moms and dads waiting for us. Moko sensei welcomed us in her taiko uniform. We sat down on the floor Japanese style and put the sticks in front of us. Then we did a Japanese greeting to start the workshop. We learnt how to hold the sticks and when to stop playing. She showed us how to play “ton ton ka ka”. Ton ton is hitting the middle of the taiko, and ka ka is hitting the edge of the taiko. We felt the vibration of the taiko sound, and our energy was getting higher. Our bodies were moving with strong taiko sound. Our faces were shining with big smile. We also said, “We love taiko. Ohana!” with taiko rhythm. Shelley played the interesting musical instrument with our taiko. It sounded very high tone compared with the low taiko sound. Some teachers were playing the tambourine and the maracas, too. We had a little walk around the taiko between the playing. The end of the one song, we did the very cool pose. One hand up and other hand front and we said “YAA!”. It was a perfect photo moment. Some moms were very busy taking photos of us from this side and that side. The last piece was “Ra se ra, ra se ra”. Moko sensei said, “Ra se ra, ra se ra” then we followed her “Ra se ra se ra se ra”. It was fun to play the taiko and shouting out with big voice. It was also a good exercise for all of us. In the very end of the workshop, Moko sensei, Shelley and Grace’s mom, Kellie, showed us a great performance. Since Kellie is taking Taiko class with Moko sensei, she was very good at playing the taiko. Grace was so proud of her mom when she was watching their performance. On the way back to school, our energy level was quite low after energetic taiko class. We walked so slow just like a turtle. We really enjoyed our special taiko time. Thank you for the powerful taiko class, Moko sensei! Thank you for joining our taiko class, moms, dads and babysitters! 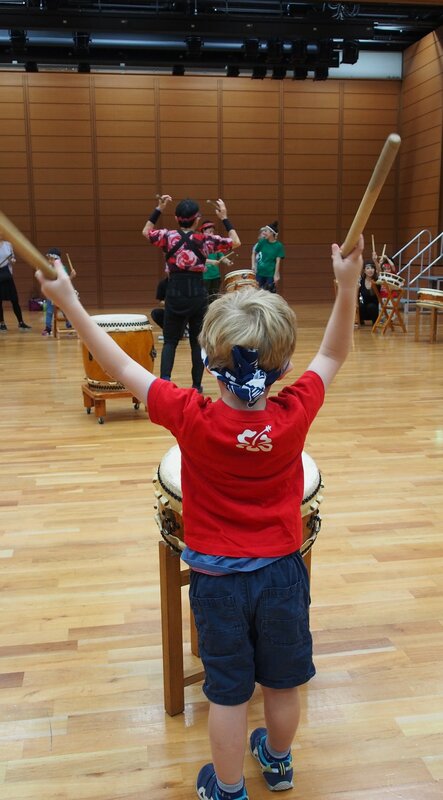 We hope that we can have taiko workshop soon again! Thank you for the fun taiko day! See you tomorrow for PLASTIC FREE FRIDAY! !